I’d seen a number of images of the Webb Bridge in Melbourne so I figured I’d take a walk down there to shoot it after sunset. I’d arrived a little early, was suitably uninspired and after checking it out for a few potential compositions later when it got darker I decided to shoot sunset over the water from the middle of the bridge (the non webby part). The following ended up being all consecutive shots. 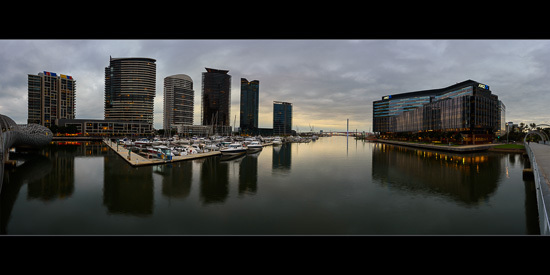 The first is a stitched panorama looking down the Yarra river over South Wharf on the left then past Bolte Bridge on the middle right and then across to North Wharf on the right. It was taken right on sunset and is a stitch of six (6) vertical frames taken at 24mm. In reviewing this frame on the back of the camera I could see potential with a long exposure. Even though the cloud cover was near 100% they were moving nicely from left to right with variation in light and dark patches. So I added the Lee 6 stop LittleStopper to turn seconds into minutes and shot this 287 second version of the composition. Pro Tip: Six (6) stops of exposure change (e.g. the addition of a 6 stop ND, changing from ISO 6400 to 100, etc) is a very useful gap. Essentially the exposure time changes from seconds to minutes. So if the base exposure time was 1 second then if all other factors remain constant (besides the 6 stop ND or ISO change) then the new exposure time is 1 minute. Likewise 2 sec -> 2 min, 3 sec -> 3 min and so on. Much easier than using some complex exposure calculation. The Bolte Bridge is a large twin Cantilever bridge which spans the Yarra River and Victoria Harbour in the Docklands precinct to the west of the Melbourne CBD. One interesting aspect of the view from our apartment is that Hamer Hall is directly below us between our building and the Yarra river. 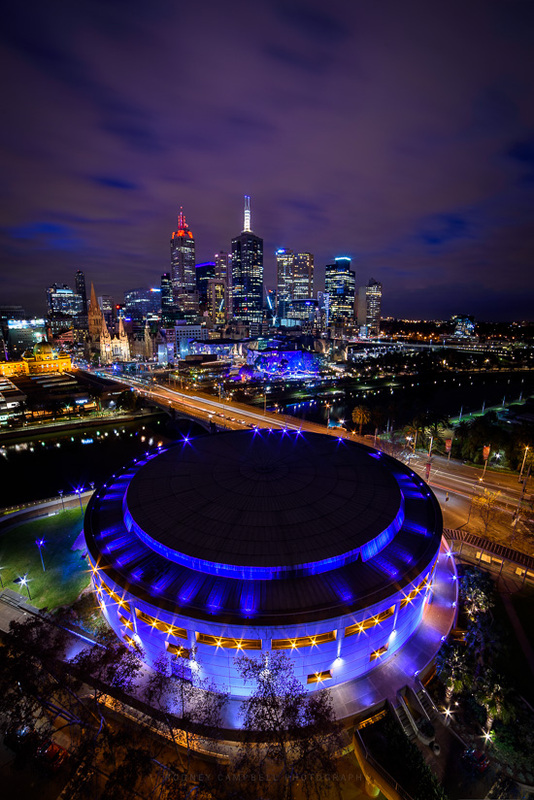 Hamer Hall (formerly the Melbourne Concert Hall) seats 2466 people over three levels. It is the largest venue in the Arts Centre complex, used for orchestra and contemporary music performances. 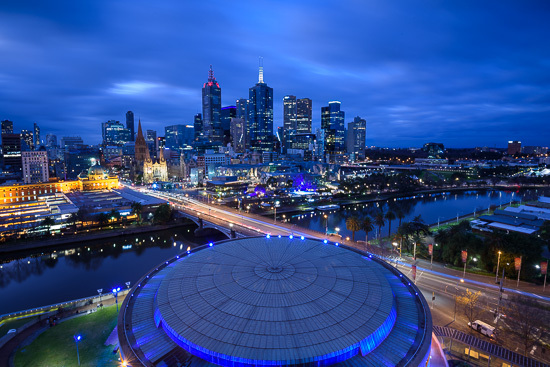 It was opened in 1982 and was later renamed Hamer Hall in honour of Sir Rupert Hamer (the 39th Premier of Victoria) shortly after his death in 2004. As you can see the building is circular and looks like this large interesting drum when viewed from above. For me it was ideally positioned to be included as some interesting foreground interest in shots of the city. I found it particularly good for vertical shots like these. With fantastic dark moody skies just before sunrise (in 5 minutes time) it provides a nice solid counterbalance to the top of the frame. Ten (10) minutes after sunrise the clouds finally lit up briefly for a few minutes as the sun tried to push through the band of cloud on the horizon just to the right. 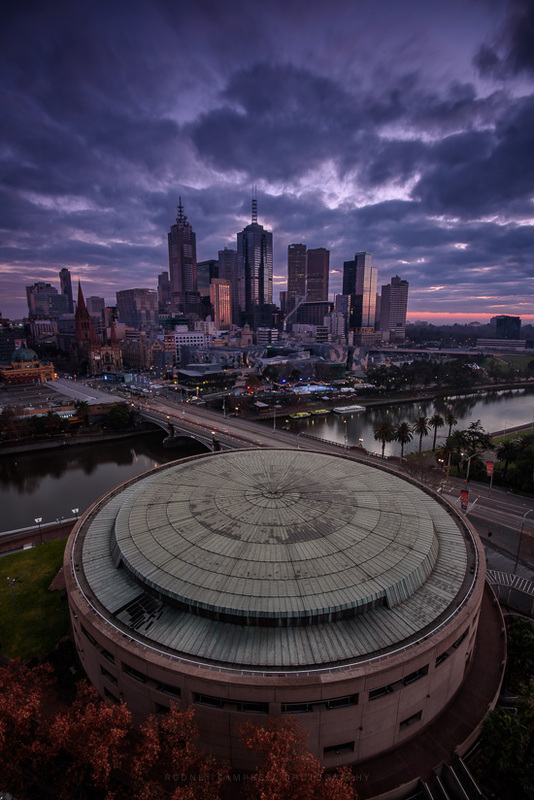 With the sun just out of frame I’ve composed the horizontal shot so the edge of Hamer Hall curves in from the right and the river from the left corner. The clouds nicely sweep out across the sky and the buildings are just starting to glow from the low angled sunlight sweeping across from the side. It didn’t last long and then the colour was gone and it was back to overcast grey :). It did however last long enough for me to shoot a sequence of frames at different exposures so I could blend them together in post. This final is the result of blending together three frames taken at 6.3, 3.3 and 2 seconds. 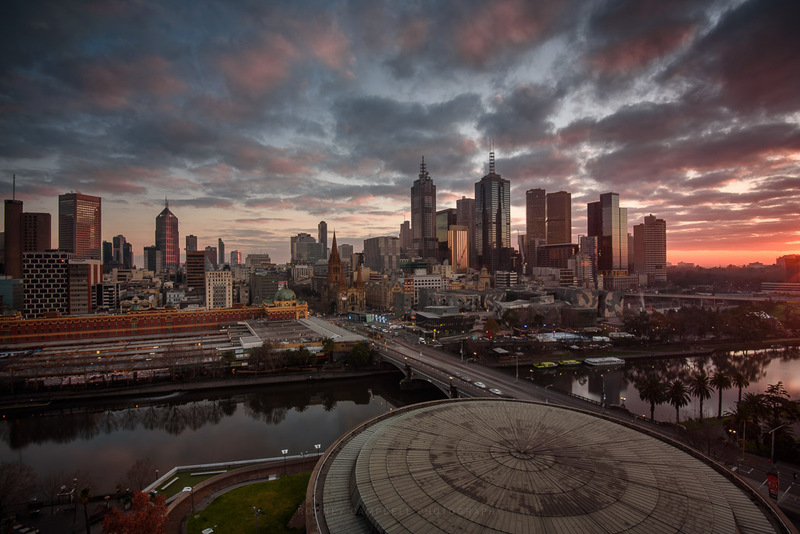 Our third day (second morning) in Melbourne and I decided to look for a rising sun. I’d woken early (too early as it turns out) and figured I’d try shooting sunrise from our balcony. My first shots were at just after 6:20AM which was still over 70 minutes before sunrise and the night sky was way too dark :). It wasn’t really till just before 7AM that we were starting to get some decent colour in the sky from the slowly rising sun. The weather during our stay was actually pretty good. 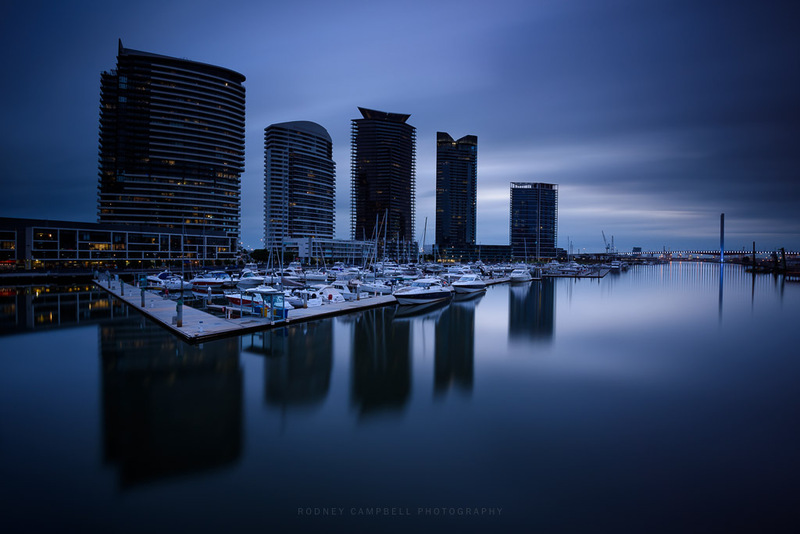 It wasn’t great for landscape photography – no epic colour or skies. The conditions however were good for a family holiday with either clear blue skies or nearly 100% overcast skies and not much between. Whilst it was very cold (as expected in Melbourne during winter) it was generally not too bitterly cold nor windy or rainy (except for some of the last two days). The first above panorama was taken at 7:10AM (25 minutes before sunrise) and is the result of stitching five (5) vertical frames. This is also one of the first times I’ve used my Kood 3 stop (0.9) Soft Graduated Neutral Density filter. I don’t normally use Soft grads. I prefer the quicker transition of the Hard grads for most of my landscape work. It suits the typical seascape scene where you have a solid flat unbroken horizon line. Here however I’ve got a cityscape scene with tall skyscrapers sticking up into the sky so a soft grad seemed appropriate. I’d actually purchased this Kood branded soft grad some time ago – it was very cheap and I just wanted to try it out. Like Lee and Format-Hitech it’s a UK filter manufacturer but it’s definitely not in the same price league as Lee or even Format-Hitech. Where-as the Lee filters might cost $100-150 each and the Format-Hitech a little less the Kood filter was around $40. Still the reviews seemed positive enough and whilst it didn’t have anywhere near the same quality level as the Lee filters it appeared to be relatively good – better than Cokin but cheaper. Timing when to shoot cities during twilight is one of the primary tricks to master. 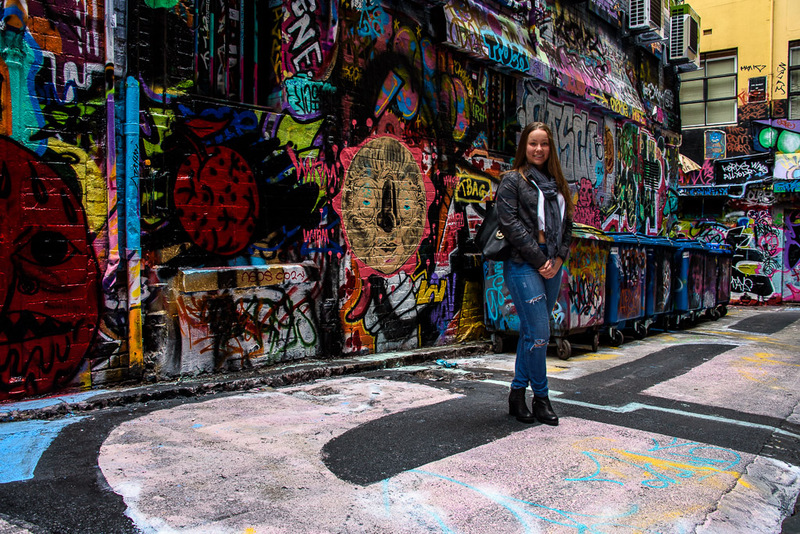 The shot above allows you to still see all the bright coloured lights in the buildings and in the streets whilst also balancing nicely with the colour and brightness of the sky. Shoot this scene earlier (15-20 minutes) and the sky and unlit parts of the ground would be black. In the shot below (20 minutes later) the ambient light levels are now so high it doesn’t allow the lights in the buildings or streets to show through much at all. One downside with the Kood filter is that it is a 100x125mm filter (all my Lee and my two Format-Hitech grads are all 100x150mm). This really doesn’t matter when I’m using the filter as a grad but doesn’t allow me to use it as a straight ND filter (but pulling the filter all the way down). This wouldn’t have been possible with a soft grad anyway since the transition band is so wide. With the hard grads however I can easily use the 100x150mm grads as a solid ND because the transition band is so narrow. It’s almost like a 100x75mm ND filter which is plenty to cover the imaging area. Another downside is that the filter is relatively neutral when used on it’s own but like my two Format-Hitech filters it tends to colour shift and introduce a noticeable magenta colour cast when stacked with other filters. I don’t get this when I stack multiple Lee filters (excepting of course the Lee BigStopper which introduces a blue cast). Lee however specifically don’t claim that the BigStopper is an ND (“Neutral” Density). You can see in the stitched panorama above that we have a definite lavender/magenta cast when I’ve stacked the Kood 3 stop (0.9) soft grad with a Format-Hitech 4 stop (1.2) ND. My daughter likes it this way and I’m partial to the lavenders myself so I’ve left it in :). My daughters and I went off exploring the city today. Lots of aimless walking down graffiti filled streets and lanes replete with sidewalk cafes, restaurants and interesting shops :). The cool bike was already here parked outside MoVida so I figured we’d make good use of it. 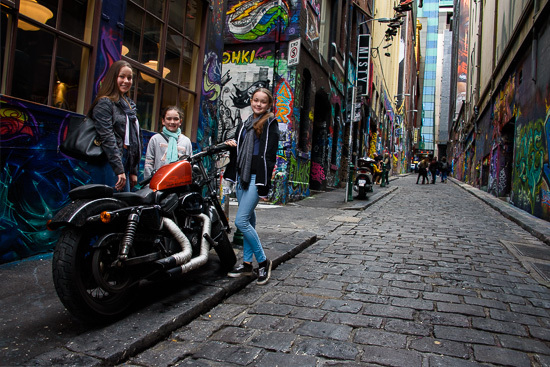 Just messing about with my girls soon after having lunch in Lygon Street. 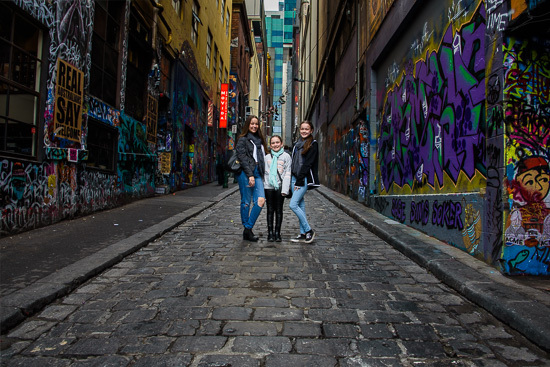 The family is taking off to Melbourne for the week during the mid year school holidays. We just wanted to get away as a family before my daughter and I head off on our two month road trip around north west Australia. 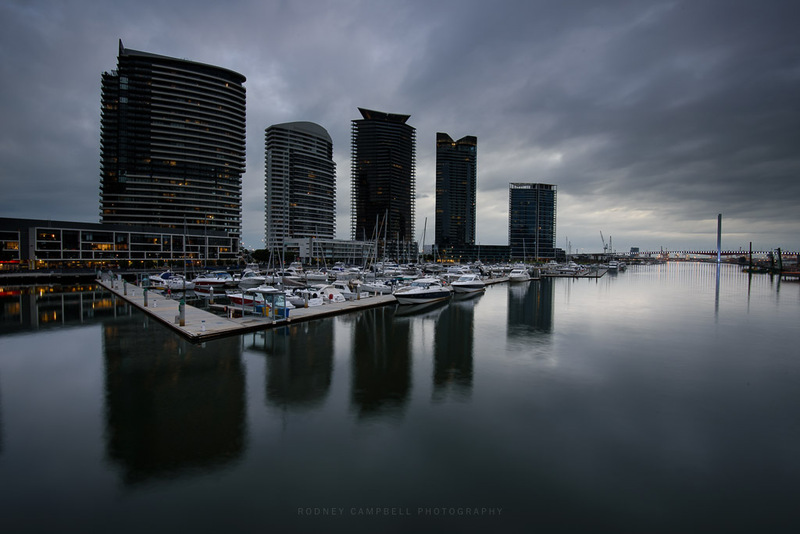 We arrived on a very wintery afternoon – the skies were grey and overcast and the cold was bitter and bleak :). I must admit that the view from the two balconies of our three bedroom apartment played some small part in the decision process to stay here. 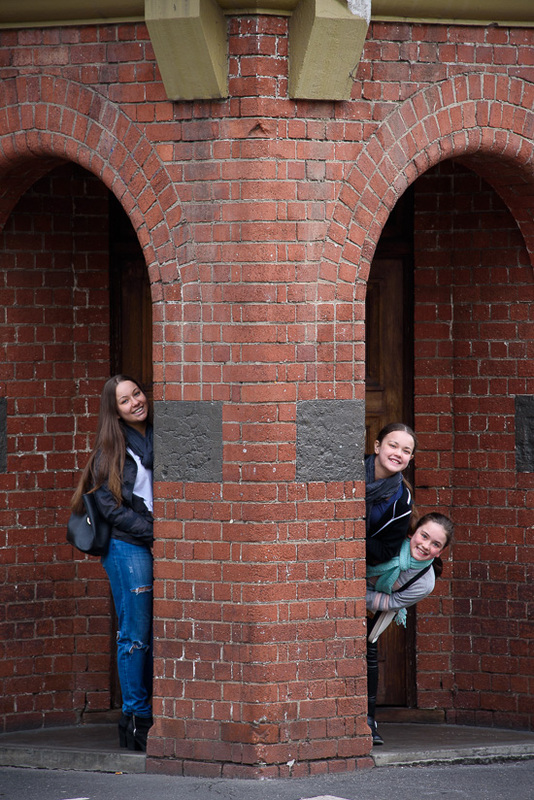 The location also allowed easy access to a number of potential photographic locations along the riverfront here in the heart of Melbourne city :). This is out first evening here. 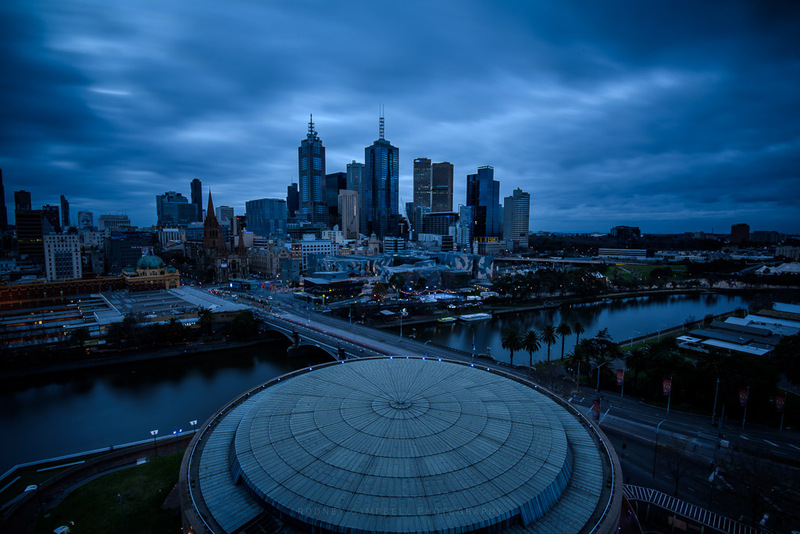 We had a glorious view from our digs in Southbank looking across the top of Hamer Hall and the iconic Princes Bridge into the heart of the Melbourne CBD. The image up top was taken a little before sunset with the addition of a little ND filters to lengthen the exposure. 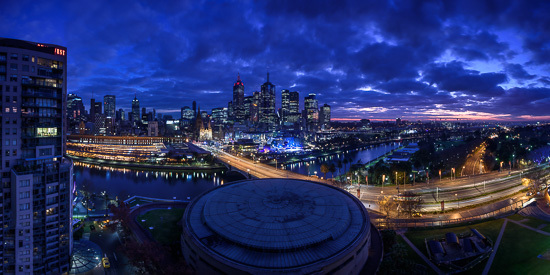 However it was after sunset when the action occurs and the city lights up when you can mix the fabulous city lights with some nice twilight colour in the sky. 5:30PM and twenty (20) minutes after sunset. 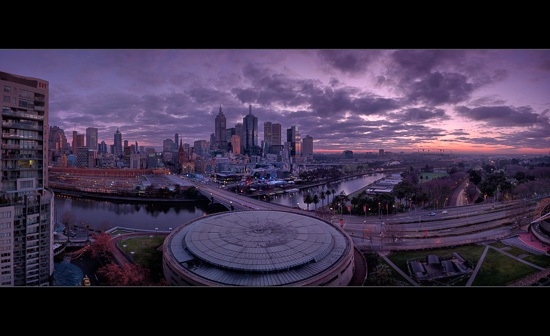 Followed by a stitched panorama of five (5) vertical frames taken at 16mm. 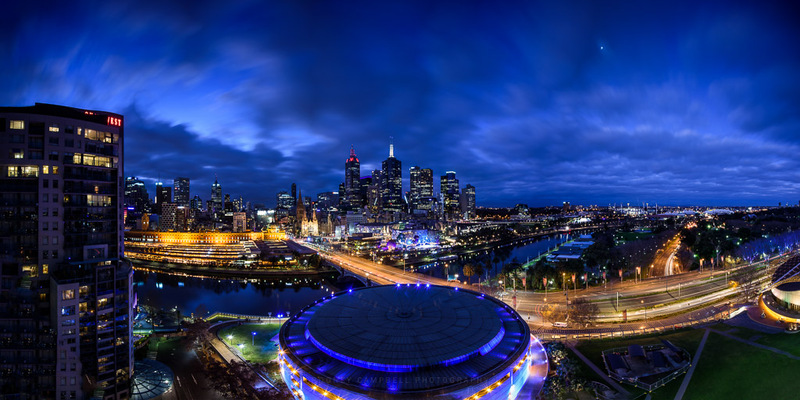 This view with the lights of the city buildings really taking off and the crazy luminous patterns in the clouds in the sky encompasses a 180 degree view with Quay West on the left and the famous Melbourne Cricket Ground (MCG) over on the right. Finally going super wide with the fantastic Samyang 14mm prime when the light of twilight had dropped almost 45 minutes after sunset. I still wanted to capture a little of the hint of colour in the so I manually bracketed seven (7) exposures from 5.7 seconds out to 61 seconds and then blended them together in post for this final result.